Pine Straw Box Baler which is usually made from wood or metal. All of our product is inspected, before being transported, to ensure that non-invasive species are not present. Each load we ship from South Carolina is inspected by a Clemson University Invasive Species Coordinator to ensure that we are in compliance with both Federal and State rules for the shipping of nursery stock. Our focus is ONLY on Pine Straw. Therefore, we turn over our product monthly, which allows our customers to receive the ‘freshest’ pine straw. You won’t receive last years’ pine straw or pine straw that has been sitting on a tractor trailer for a year from our company. Our pine straw is protected from the elements and kept dry once it is baled and ready for sale. We source directly from designated Longleaf plantations where the pine straw is hand-raked and hand-baled. This allows us to obtain only the highest quality longleaf pine straw. Hand-raking and hand-baling also reduces the amount of forest debris and sticks. Our customer service will exceed your expectations. We form long-lasting relationships with our customers. We are a family-owned and operated business and involved with pine straw since 2007. The Pine straw we source is harvested in South Carolina. The pine straw is hand raked on designated property. Each raker works a section of the field where they will assemble a pile of pine straw. From this pile, the raker will pick-up with two handfuls of pine straw and shake the straw to remove any debris. The the pine straw is then placed in the metal or wooden boxes ("balers") which are shown below. The pine straw is then compressed into the box and tied with two strings to secure the bale. At the end of each day, the bales are placed into a trailer for storage. Pine straw is raked year round to ensure that our pine straw mulch supply is fresh. The trailer is then loaded and ready to transport to us here in Pennsylvania. The below videos and pictures were taken to help educate our customers about pine straw. People often ask, "Where does pine straw come from?". The answer: In South Carolina, as well as the Sand Hills of North Carolina where large tracts of Longleaf Pine Trees reside. A freshly raked field. 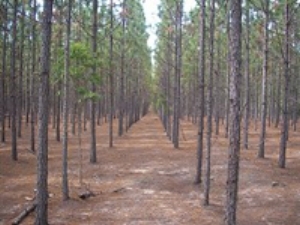 Long Leaf Pine Trees grow in sandy soil. A load of freshly raked Pine Straw getting ready to get loaded into a trailer. The dark green area represents the historic range of the Long Leaf Pine Tree. An initiative is underway with the USDA to re-establish Long Leaf Pine Trees to their native range. A clean field (meaning no debris such as pine cones, weeds or branches) ready for raking in the near future.